1991-01-03. New. Ships with Tracking Number! INTERNATIONAL WORLDWIDE Shipping available. Buy with confidence, excellent customer service! 1991-07-07. New. Ships with Tracking Number! INTERNATIONAL WORLDWIDE Shipping available. Buy with confidence, excellent customer service! CRC Press. PAPERBACK. 0877628750 New Condition. . New. CRC Press. PAPERBACK. 0877628750 Like New Condition. . Fine. 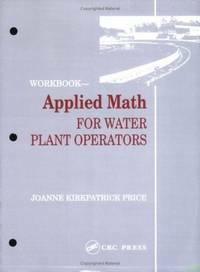 Joanne K Price - Applied Math for Water Plant Operators - Workbook - Hardback. Book. BRAND NEW. CRC Press. Hardcover. 1138475300 Brand New ,Original Book , Direct from Source , Express 5-8 Business days worldwide Delivery. . New. 1991-01-03. Good. Ships with Tracking Number! INTERNATIONAL WORLDWIDE Shipping available. May not contain Access Codes or Supplements. May be ex-library. Shipping & Handling by region. Buy with confidence, excellent customer service! 1991-07-07. Good. Ships with Tracking Number! INTERNATIONAL WORLDWIDE Shipping available. May not contain Access Codes or Supplements. May be ex-library. Shipping & Handling by region. Buy with confidence, excellent customer service! CRC Press. PAPERBACK. 0877628750 Brand new book.Buy with confidence. Money Back Guarantee.Expedite Shipping Available. International shipment available. . New. CRC Press. Hardcover. 0877628742 Brand New, printed in english , Ready to ship, fast delivery (6-8 busienss days ) worldwide . New. CRC Press, 1991-07-22. Hardcover. Good. CRC Press, 1991-02-12. Workbook. Paperback. Used:Good. CRC Press. PAPERBACK. 0877628750 Brand New, printed in english , Ready to ship, fast delivery (6-8 busienss days ) worldwide . New. CRC Press, 1991-02-12. Paperback. Good. CRC Press, 1991-07-22. 2nd. Hardcover. Used:Good. Lancaster, PA.: Technomic Publishing Co., 1991. xiv, 446 pp. With illustrated calculations throughout the book. Near Fine.. Second Edition. Hard Cover.